Gartner's recently released Magic Quadrant for Business Intelligence Platforms highlights a trend which all BI practitioners have observed over the past few years : the divide between Traditional enterprise BI platforms and Data Discovery platforms and the resultant confusion amongst decision makers about which one to opt for. "The chasm between these segments has deepened because business users find the benefits of using data discovery tools so compelling that they make this choice despite the risk of creating fragmented silos of data, definitions and tools. This has accentuated the need for IT organizations to back away from a single-minded pursuit of standardization on one vendor to a more pragmatic portfolio approach." Gartner views "capabilities for integrating departmental and enterprise data models" as one of 10 important capabilities for Quadrant placement. I would focus on the direction it should be headed. And the single word answer to that is "simplification". The current and evolving paradigm of user-technology interface can be defined by a single word : "Google". Never before has the "Keep it Simple, Stupid" paradigm been so successful. And that is the direction which BI needs to head to also. A simple, single line search box which delivers context specific search and reporting capabilities. A sales rep types in the name of a city and links to sales report(s) for all customers in that city appear. Also an Amazon.com kind of feature -" People who viewed this report also viewed...". Gives the user a quick and easy feel of what else s/he should be looking for. Building in "crowd intellect" into the reporting capabilities. And what about a feature which allows a user to know who else is looking at a particular report in real-time or has viewed the report earlier (a viewing history). Combine this with interactive chat or communication capabilities and you have transformed a "report" into a "collaborative interaction". 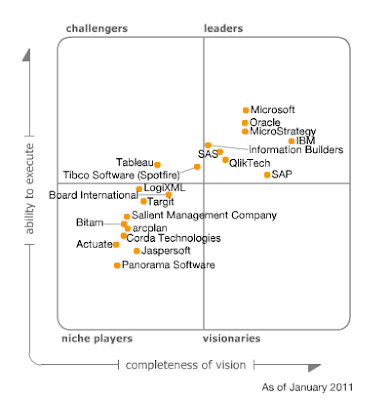 Did I miss Geospatial analytics and GPS, how about integrating them with BI capabilities. A manager viewing a report, identifies issues with a particular customer, is able to identify the sales rep closest to that location based on the GPS capabilities of the handheld the rep is carrying and asks him/her to visit the customer. Staying on Google, I think that it may not be long before they enter the BI arena. They know how to manage huge volumes of data, run server farms and manage an analytics front end , currently primarily used to present information related to blogs/website statistics but can easily be modified as a front-end for business related information. They have confounded me by not showing their hand yet. There was a time when we had BI Tools, then vendors started branding them as Applications. These days several vendors are offering BI Appliances. Following the trend to it's logical conclusion, I would think that very soon we may see BI Machines or BI Engines. Is "Watson" going to be the BI Machine/BI Engine of the future? "Elementary, My dear Watson", I hear as I stroke my Sherlockian chin.